086’s offer to take the graphics he made for his site menu was nice, but inappropriate. True, amateur sites of the pre-template web were build with extensive use of found graphics. But the navigation bar was the element everybody tried to keep unique: so it was a constant experiment with form and pattern of the buttons. A typical result is on the image below. This image also provides a typical example of navigation that is made in advance. 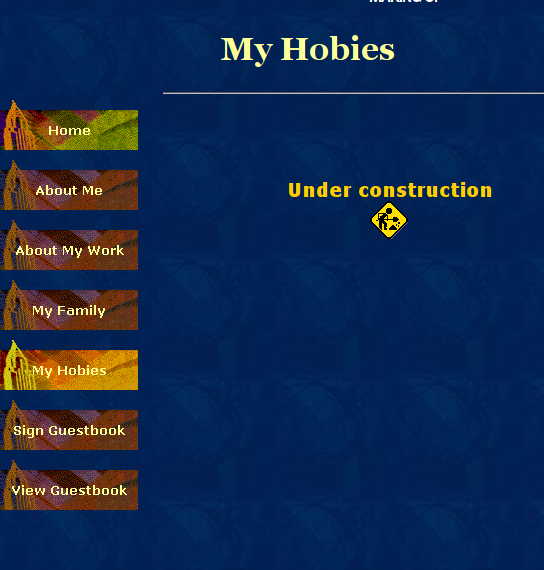 The button “Hobies” exists before anything about the Hobbies was written. 15 years later this childhood disease of webdesign is not fully conquered.